Home > MF - Debt Funds > Nine Types of Indian Debt Mutual Funds..! Nine Types of Indian Debt Mutual Funds..! 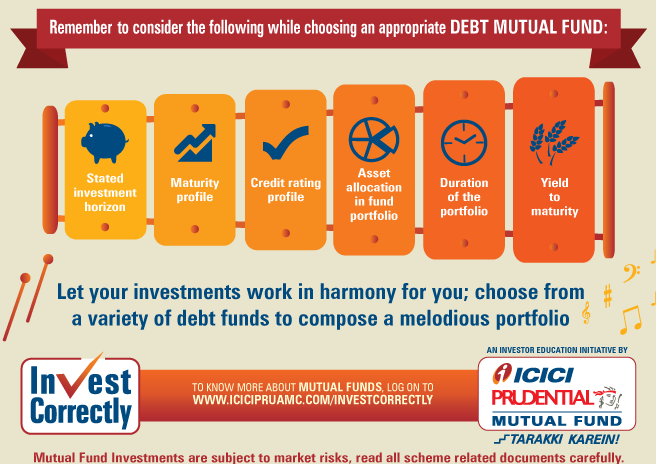 There are different types of Debt Mutual Funds (MFs) that invest in various fixed income securities of different time horizons. These funds invest in highly liquid money market instruments and provide easy liquidity. The period of investment in these funds could be as short as a day. They aim to earn money market rates and could serve as an alternative to corporate and individual investors, for parking their surplus cash for short periods. Returns on these funds tend to fluctuate less when compared with other funds. Earlier known as Liquid Plus Funds, they invest in very short term debt securities with a small portion in longer term debt securities. Most ultra short term funds do not invest in securities with a residual maturity of more than 1 year. Also referred to as Cash or Treasury Management Funds, Ultra Short Term Funds are preferred by investors who are willing to marginally increase their risk with an aim to earn commensurate returns. Investors who have short term surplus for a time period of approximately 1 to 9 months should consider these funds. These funds primarily invest in floating rate debt securities, where the interest paid changes in line with the changing interest rate scenario in the debt markets. The periodic interest rate of the securities held by these products is reset with reference to a market benchmark. 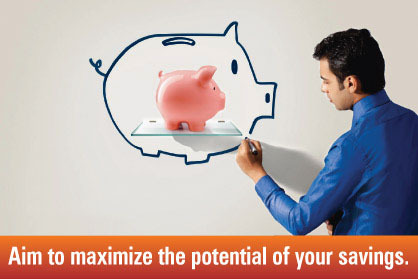 This makes these funds suitable for investments when interest rates in the markets are increasing. These funds invest predominantly in debt securities with a maturity of upto 3 years in comparison to a Regular Income Fund. These funds tend to have a average maturity that is longer than Liquid and Ultra Short Term Funds but shorter than pure Income Funds. These funds tend to perform when short term interest rates are high and could potentially benefit from capital gains as liquidity comes back to the market and interest rates go down. These funds are suitable for conservative investors who have low to moderate risk taking appetite and an investment horizon of 9 to 12 months. These funds comprise of investments made in a basket of debt instruments of various maturities & issuers. These funds are suitable for investors who willing to take a relatively higher risk as compared to corporate bond funds,and have longer investment horizon. These funds tend to work when entry and exit are timed properly; investors can consider entering these funds when interest rates have moved up significantly to benefit from higher accrual and when the outlook is that interest rates would decrease. · A. Income funds invest in corporate bonds, government bonds and money market instruments. However,they are highly vulnerable to the changes in interest rates and are suitable for investors who have a long term investment horizon and higher risk taking ability. Entry and exit from these funds needs to be timed appropriately. The correct time to invest in these funds is when the market view is that interest rates have touched their peak and are poised to reduce. · B. Gilt Funds invest in government securities of medium and long term maturities issued by central and state governments. These funds do not have the risk of default since the issuer of the instruments is the government. Net Asset Values (NAVs) of the schemes fluctuate due to change in interest rates and other economic factors. These funds have a high degree of interest rate risk, depending on their maturity profile. The higher the maturity profile of the instrument, higher the interest rate risk. 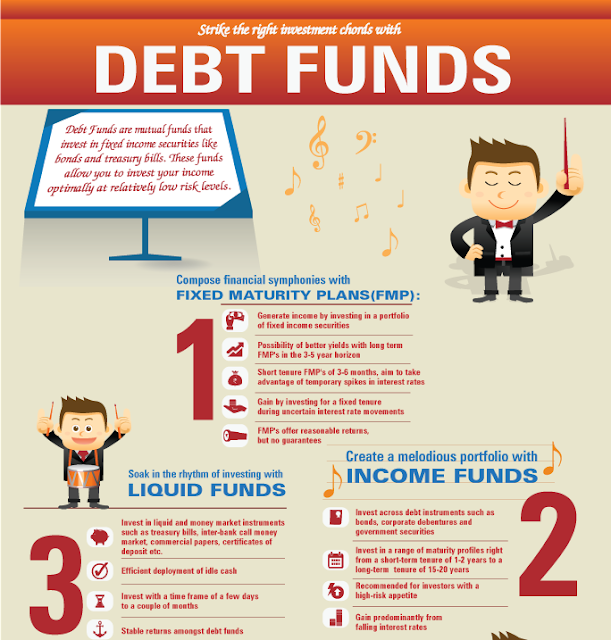 · C. Dynamic Bond Funds invest in debt securities of different maturity profiles. These funds are actively managed and the portfolio varies dynamically according to the interest rate view of the fund managers. These funds Invest across all classes of debt and money market instruments with no cap or floor on maturity, duration or instrument type concentration. These funds invest predominantly in corporate bonds and debentures of varying maturities that offer relatively higher interest, and are exposed to higher volatility and credit risk. They seek to provide regular income and growth and are suitable for investors with a moderate risk appetite with a medium to long term investment horizon. 8. Close Ended Debt Funds..
· Fixed Maturity Plans (FMPs) are closed ended Debt Mutual Funds that invest in debt instruments with a specific date of maturity that is less than or equal to the maturity date of the scheme. Securities are redeemed on or before maturity and proceeds are paid to the investors. FMPs are similar to passive debt funds, where the portfolio manager buys and holds the debt securities for the entire duration of the product. FMPs are a good option for conservative investors, as they do not carry any interest rate risk provided the investor stays invested until the maturity of the product. They are also a tax efficient investment option. 9. Hybrid / Balance Funds..! They bridge the gap between equity and debt schemes by investing in a mix of equity and debt securities. This adds a considerable amount of risk to the product and will suit investors looking for commensurate returns with higher levels of risk than regular debt funds. · A. Monthly Income Plans (MIPs) strive to offer the benefit of diversification across asset classes by investing a proportion of the portfolio in debt securities (70% to 95%) with a smaller allocation in equity securities (5 % to 30 %). As the correlation between prices of equity and debt is low, this product endeavors to give an investor returns that are relatively higher than debt market returns. However, an important point to be noted is that monthly income is not assured and it is subject to the availability of distributable surplus in the fund. · B. Capital Protection Oriented Funds are closed ended funds that are hybrid in nature; they allocate money to debt and equity securities. The allocation to debt securities is done in such a way that at the end of the term of the product, the value of debt investment is equal to the original investment in the fund. The equity portion aims to add to the returns of the product at maturity. These funds are oriented towards protection of capital and do not offer guaranteed returns. Say, for example, AAA bonds are quoting at interest rate of 10% p.a. for a 5 year term. This means that at the end of 5 years, the investment of Rs. 100 in such bonds would be worth Rs. 161.05, assuming reinvestment of the interest. o On the other hand, if one invests Rs. 62.09 in such bonds, the value of the bonds at the end of 5 years would be Rs. 100. In such a case, the allocation between equity and debt would be 38 : 62 respectively. So, if the equity value reduces to zero, the investor gets back the original amount invested. The asset allocation is a function of prevailing interest rates on high quality (AAA rated) bonds. It is mandatory for the fund to be rated by at least one rating agency in order to be called a capital protection oriented fund. Debt securities held in the portfolio must be of highest rating. · C. Multiple Yield Funds are close ended income funds that aim to optimize income from debt securities and potential growth from equity. They aim to limit the downside by investing in rated debt instruments of reputed issuers. Through a limited equity exposure, they aim to provide capital appreciation by investing in shares of companies without any sector or market capitalization bias. This exposure will help to participate in the growth of these companies thus seeking to provide the portfolio with an element of potential long term capital appreciation.